When dreaming about your ideal outdoor living project, do you have trouble deciding what type of structure you want? Why limit yourself? 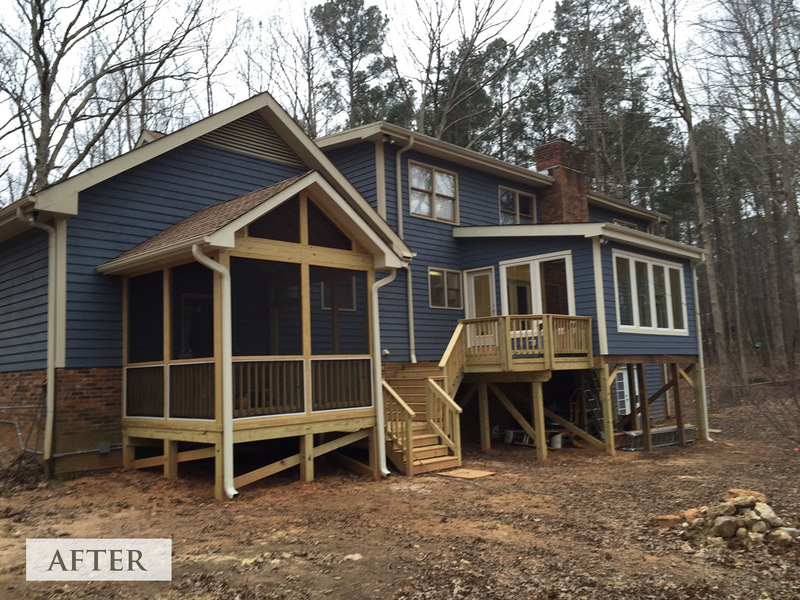 The Archadeck of Raleigh Durham team recently created a custom combination project for a wonderful Raleigh family that brought together a sunroom, screened-in porch, and grilling deck for all the best options in outdoor living and entertaining. 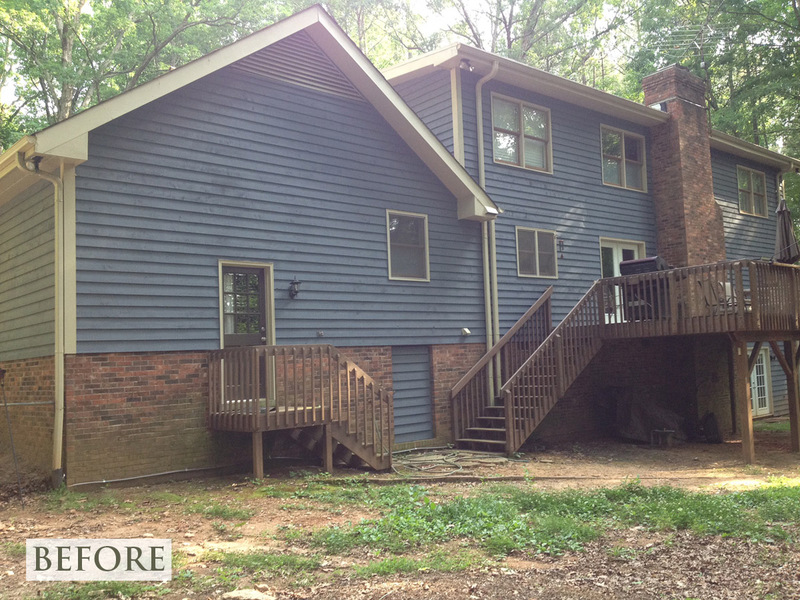 As our starting point, the clients’ home had an existing wood deck with a set of matching stairs that opened into the backyard. The family’s design request was for a bright, airy addition that they (along with family and friends) could use year round. They also wanted a space for the husband to enjoy cigars outside with coverage from the weather. 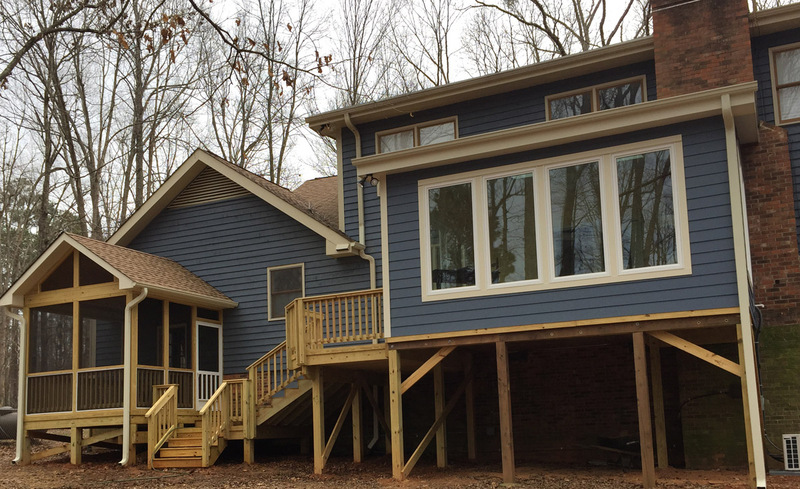 By adding a sunroom and screened porch, and transforming what remained of the deck, we were able to meet our clients’ needs. 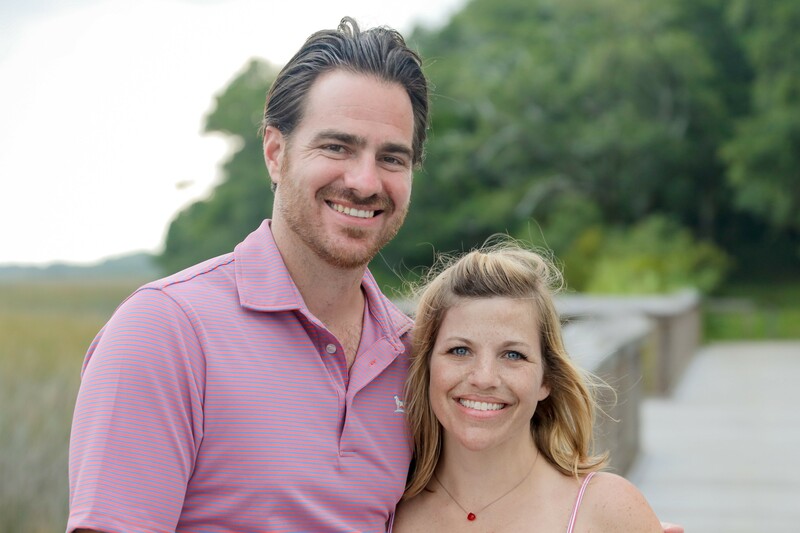 Together we designed and created a cohesive, three-part outdoor living space that blended seamlessly with the existing home. A sunroom addition is a fantastic investment for enhancing your indoor/outdoor lifestyle and increasing the value of your property. Building a sunroom is the most complex out of all the outdoor living structures, since you are adding a closed, interior room as opposed to an external, open structure. Sunrooms are typically filled with windows to provide a picturesque view of your landscape and to give the feeling that you are immersed in nature. They also offer greater options for heating and cooling than outdoor structures, in order to maximize year-round usage like the inside of your home. 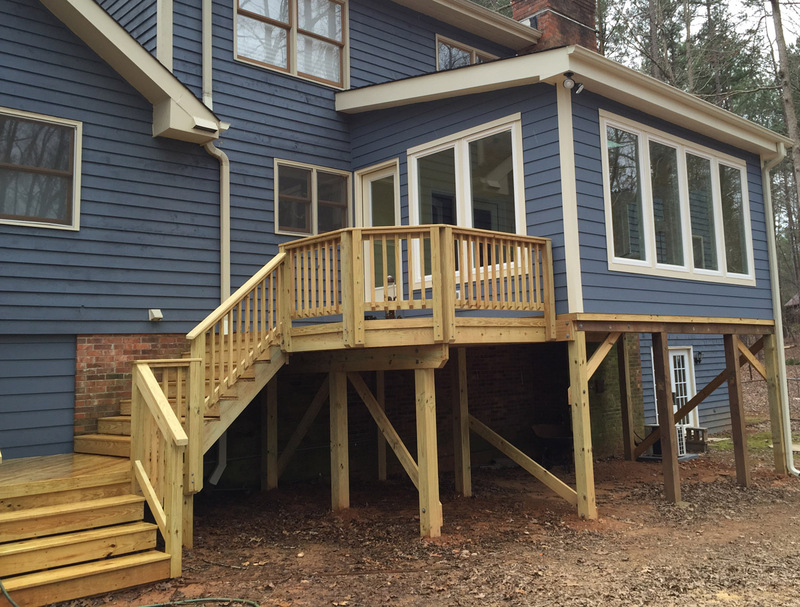 For this Raleigh family, building a sunroom on top of the existing deck helped maximize available space and cut down on costs. 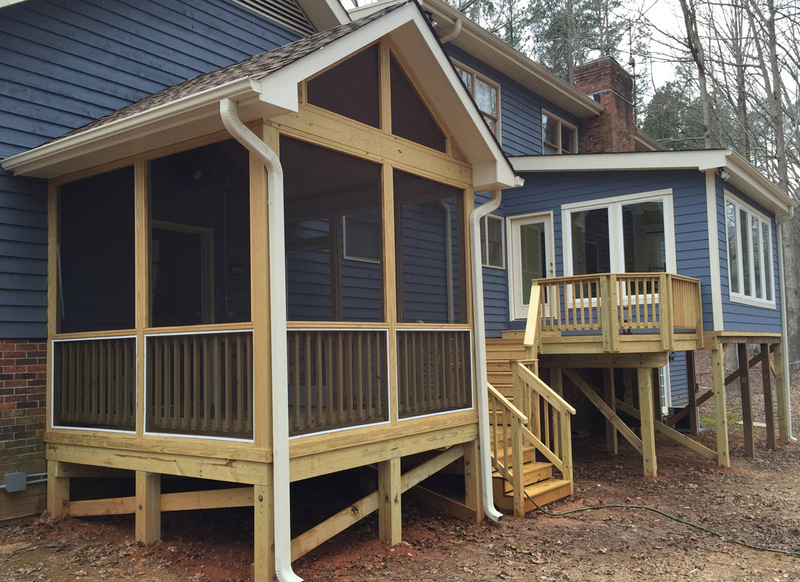 We added extra structural support underneath the existing deck to accommodate the new, additional load. After removing the old decking, we installed new sub-flooring and Mannington Seascape porcelain tile (that mimics the look of wood). 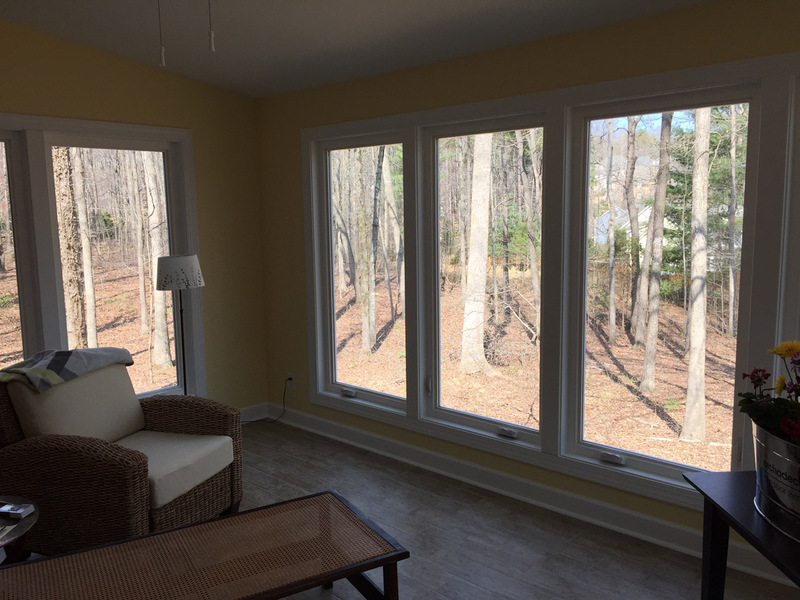 The sunroom also features floor-to-ceiling Jeld-Wen casement windows and a low-pitch shed roof to allow as much ceiling height as possible, while fitting beneath the second story windows. For the exterior, we were able to match the cream trim and the blue siding perfectly, making this sunroom addition look original to the home. 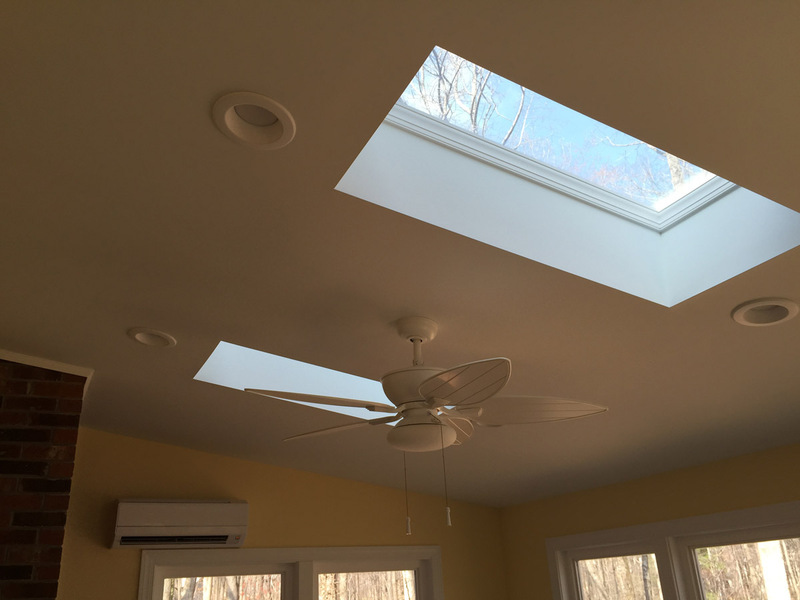 To add to the family’s year round enjoyment of their sunroom addition, we installed a Trane mini-split A/C unit for efficient heating and cooling of the space during really hot and cold months. We further increased the brightness of the space with two Velux skylights, allowing for as much natural sunlight to come in as possible. The windows fully open and close, allowing 100% airflow, and the drywall finish makes the space as polished and finished as the regular interior rooms. To address the husband’s wish for a well-ventilated outdoor space for enjoying cigars, we were able to build a private screened in porch right outside of their home office. The space provides a relaxing and comfortable spot for smoking cigars in rain or shine, while also keeping the smell of smoke from infiltrating the home. The open gable roof of the screened porch matches the pitch of the home’s roofline, further blending the new outdoor structure with the existing home. Since we used the existing deck as the base for the sunroom addition, we still needed an open-air spot for grilling. To compensate for the lost space, the space between the sunroom and the screened in porch became the perfect spot for a grilling deck. The landing and stairs further connect the porch and sunroom spaces, allowing traffic to flow effortlessly among all three outdoor spaces.